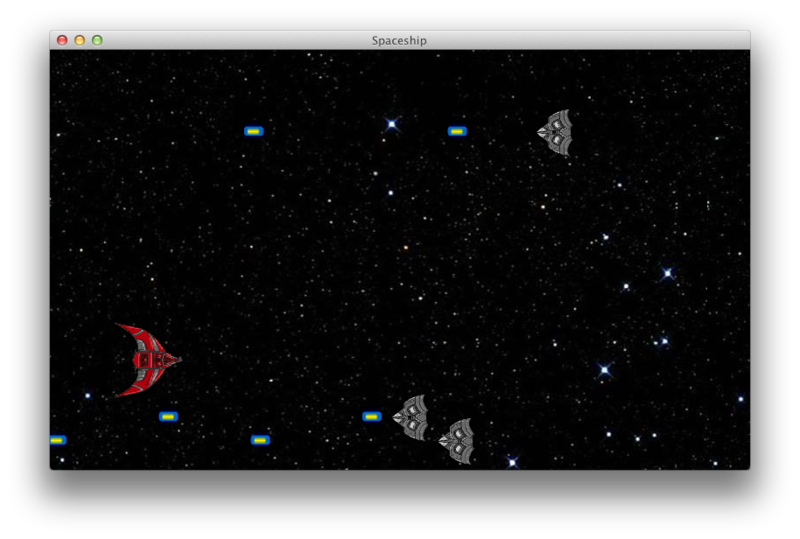 Hellow Guys, this week will be really simple, nothing really new, this tutorial will be 3 steps, the first one we will add a very simple background moving behind our ship, and it is really simple and without parallax (a theme that we may abort later), the second step we will add some enemies and the third step is make this enemies shoot on our ship, but this week won’t have any kind of collision (a theme for our next week) 😉 Oh, and if you want to read our last tutorial the link is HERE! 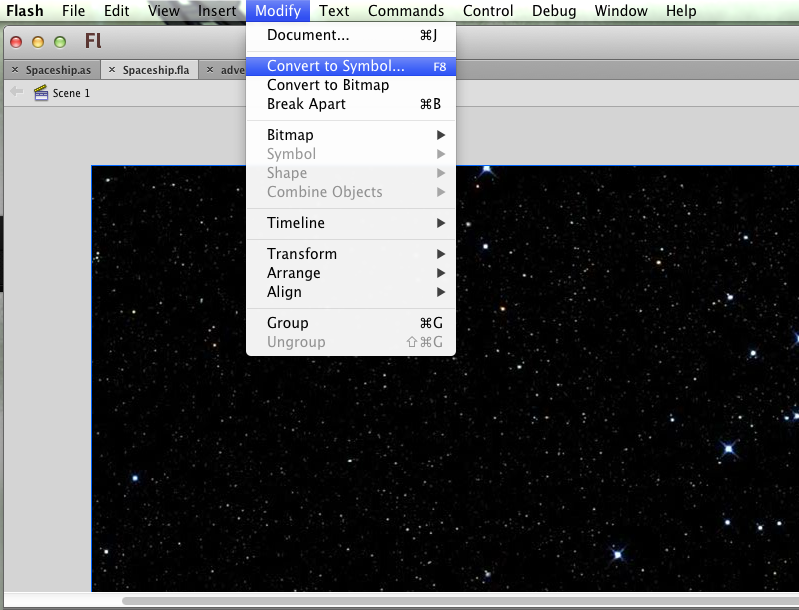 The first thing, let’s add our background to our scene, drag the image bellow to your scene, in your document in Spaceship.fla: -So select it, and click in “Modify->Convert to Symbol…”. Now go to our function “Draw” and let’s make the background begin to move: What happens bellow: We created two Backgrounds the same class background to keep it in infinity looping. And now if you test our project, the background will be moving against our ship. 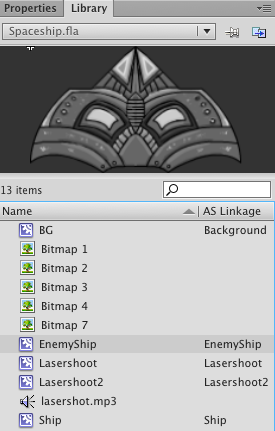 Now the enemy ship, you will do with enemy ship bellow almost the same you did with the Background, In other words, add this to our Library with the name EnemyShip and class: EnemyShip linked. 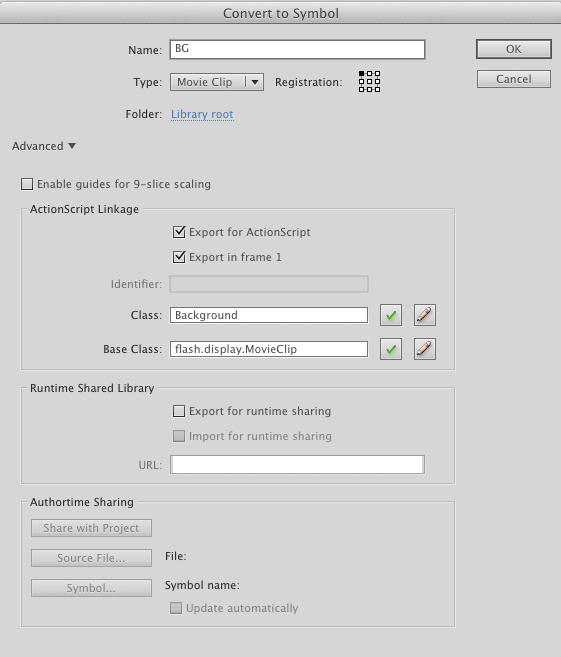 -Import the image bellow to your flash document. Explaining: _directionMov will be a var that will tell with a string the direction that our enemy ship will follow. _cooldownweapon is what the name say, the actual value of the interval shoots of the enemy. _cooldownweaponmax is the max interval time, is the full time it will take to “reload” for the next shoot of the enemy. _shootspeed, is the speed of our enemy laser shoot. Let’s create another function called “addEnemyShip”. Like the name say, this function will add a new enemy on our scene. Explaining here; We created a function where it will be called on our function “Draw” and tell the x position, y position and the direction that enemy will follow. Explaining: This enemyShoot will create the lasershoot2 for the enemy and send it to the player direction. The “hindex” is the enemyship’s position on the array enemyList. Som if the enemyShip is out of screen with “x”<-100, it will be “deleted” from the scene. Oh and our project till now can be downloaded HERE. How come you have stopped? Also you haven’t mentioned how to export the app for iOS? Where’s the final step with collisions?